Eating for healthy skin? eliminate make-up and let a healthy diet do the work. 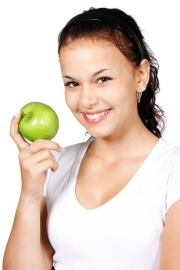 Eating For Healthy Skin, Put Away The Make-Up And Let A Healthy Diet Transform Your Skin. In the area of beauty, eating for healthy skin has become a major role for those you are concerned about their physical appearance. Every day and everywhere you look, women and even some men are captivated about pretty skin, so they spend the little they have on external products like creams, oils and so on to have that smooth looking appearance. Well, it is not what you put on your shin, but what you put in your body that gives you that healthy radiant look. What's the problem then? "People don't know what to eat and drink in order to make this happen, so they listen to anyone who has a skin product and settle with that." Most of the population is ignorant concerning this fact: “what you put into your body is what you will get out on your body” But what I need to establish here is that, almost 100% of the time, skin problems are internal base on what you eat, and eating for healthy skin is indispensable... it must be healthy food. Below is what you must do in order to have radiant skin. Let the truth be told; eating for healthy skin is not as hard as people make it out to be. You must eliminate the toxins from your body. When toxins cannot escape through your urine or sweat, it will reveal itself in the skin with the visibility of pimples, discoloration, and a scaled look. Drink 6-8 glasses of water a day to remove the toxins in your body. This is the number one way to a healthy looking skin. Consume vitamins A, C, and E which are good for your skin along with sunlight for your vitamin D.
Vitamin A benefits the skin by normalizing keratin which is the key structural material making up the outer layer of the skin and it also regulates the sebum that contributes to acne. Sebum is a microscopic gland in the skin that secrete an oily/waxy matter that lubricate and water prove the skin. It also treats and reverse cellulite. Foods with vitamin A includes: sweet potatoes, parsley, kale, spinach, mangoes, broccoli, and squash. Vitamin C Is an antioxidant that fights against free-radicals that damage skin cells. It regulates collagen synthesis; a key structural protein in the skin. But the benefit of vitamin C is... when it is delivered to the skin cells it's a good chance you will improve your skin by reducing wrinkles and improving skin texture. Foods for vitamin C are: Kiwi, oranges, pineapples, raspberries, tomatoes, cherries, lemons, and cabbage. Vitamin E is an antioxidant that protects against oxidative damage and provides protection from harmful UV rays to the skin. Foods of vitamin E are: almonds, wheat germ, olive oil, spinach, sunflower oil, peaches, avocados, and soybeans. Vitamin D is form naturally in man and is stored in the liver. The major part of vitamin D circulates throughout the blood and is synthesized in your own skin. If you are exposed to the sun, even in small quantities, there is no need to depend on food for this vitamin. Food for vitamin D: is sunlight. Go out into the sun every day to get your vitamin D. Eating for healthy skin requires you to abstain from alcohol, food overloaded with spices, and process food. Replace it with a well balanced diet with the vitamins mentioned above and that should be enough to restore health to and abuse skin.